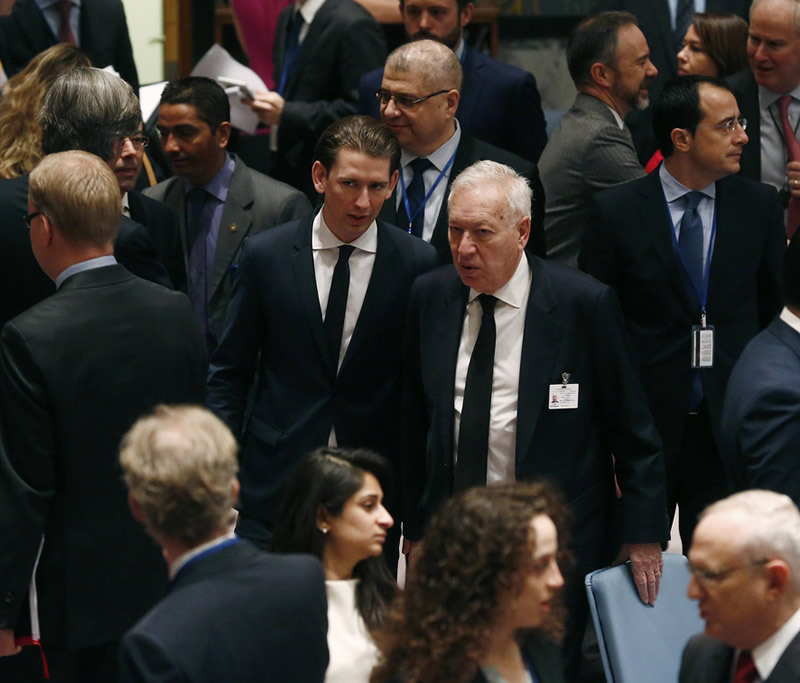 At the UN Security Council's open debate on the current situation in the Middle East on March 27, Austrian Foreign Minister Sebastian Kurz spoke about ethical and religious tensions in the region. In the course of his visit to the UN headquarters, Minister Kurz also met with UN Secretary General Ban Ki-moon, discussing current crises as well as matters related to the UN-offices in Vienna. In his bilateral meeting with the Foreign Minister of Libya, Gebran Bassil and the Chaldean Catholic Patriarch of Babylon, Louis Raphael I. Sako, Minister Kurz focused on the situation of religious minorities in the Middle East. A working lunch with UN Deputy Secretary General Jan Eliason and other foreign ministers concluded his New York trip. The year 2015 marks the 20th anniversary of the sister city agreement between New Orleans and Innsbruck as well as the 40th anniversary of the University of New Orleans' International Summer School in Innsbruck. One of the largest outbound programs of its kind in the United States, the summer school over the years has brought over 10,000 American students to the heart of the Alps. On the occasion of both anniversaries, a delegation of high-ranking officials from the City and the University of Innsbruck met with counterparts from the City, the Port Authority and the University of New Orleans for a number of briefings in order to shape the continuous cooperation. Festivities were crowned by a celebratory evening on the University of New Orleans campus, during which the representatives of both cities and universities were joined by summer school alumni, teaching staff and the Austrian Honorary Consul General Phil Lorio, braving the unusually cold weather –thus a real "alpine" evening. The Austrian delegation with University of New Orleans President Peter J. Fos (right). Photo: Mariana Zanotti Martinez. Join the Embassy of Austria on April 14 and 15 at 7:30 pm for the Exhibition and discussion of "CAMPUS WU - A HOLISTIC HISTORY": Meet Laura P. Spinadel, one of the leading architects of the new campus of the WU Vienna (Vienna University of Economics and Business). Spinadel and her team from BUSarchitektur developed the framework for all participating architects, including location, traffic routes, light, sun and wind. The Austrian Studies Association (ASA) held its annual conference under the theme "Crossing Borders – Blurring Borders" at the University of Michigan, Dearborn on March 26-28, 2015. ASA promotes discussions within Austrian Studies from the widest variety of perspectives. The conferences brought together over 100 Austrianists from three continents to exchange their research and findings in topical panels over three days. Program highlights included an art exhibit opening and talk by artist Ursula Hübner, entitled "Bodily Obsessions: The History of Austrian painting via Egon Schiele, Maria Lassnig, Ursula Hübner, and other Affinities". The Austrian Honorary Consul in Detroit, Dr. Alois Schwartz, was in attendance to greet participants. Furthermore, author Maja Haderlap, writing about crossing the border from Carinthia and Slovenia, read from her novel Engel des Vergessens. In addition, the program also included a film screening and discussion of the TV film Franz Fuchs – a patriot, in which actor/director Karl Markovics portrays the right-wing terrorist of the same name. Mr. Markovics joined the discussion via Skype. Previously, he had played Salomon Sorowitsch in Stefan Ruzowitzky's 2007 film The Counterfeiters, winning the Academy Award for Best Foreign Language Film in that year. Join Austria's most prominent winemakers presenting over 40 exquisitely crafted Austrian wines at a tasting on April 20: The dinner reception of Austrian wine and cuisine will offer a rare opportunity to meet and speak directly with the winemakers while sampling some of their best new wines imported to the USA. For the tentative list of winemakers and the wines to be served, as well as tickets, please visit the website of the International Club DC.